In February of 2018 in Jiangsu China Reports 1st Novel H7N4 Human Infection, we learned of the first known human infection with a novel H7N4 virus which resulted in a 3-week hospitalization for a 68 year old woman in Jiangsu Province for severe pneumonia. Eight days later, in WHO: Genetic Characteristics Of Avian H7N4, we learned this AI virus was a purely avian LPAI H7 strain - distinct from A(H7N9) - although it carried the PB2 637K marker associated with mammalian adaptation. It's been a year, and very little else has been reported on the H7N4 virus, likely due - at least, in part - to China's massive H5+H7 poultry vaccination campaign, which began about 20 months ago. Since then, avian flu reports out of China have been greatly subdued. Although it isn't exactly a stop-the-presses! 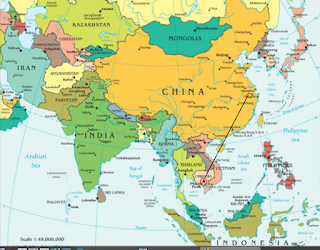 moment, today the OIE has been notified of multiple detections of LPAI H7N4 in poultry in southeastern Cambodia, relatively near their border with South Vietnam. While details on these outbreaks are sparse, somewhat surprisingly, these outbreaks are listed as having an onset date of February 2018, but are only now being announced. I suspect that routine samples were collected from poultry a year ago, put into a low priority queue, and have only recently been tested. Hopefully we'll get more details on exactly what happened. Also, it isn't immediately apparent how closely related these H7N4 avian viruses are to the one reported in China in early 2018. Again, hopefully we'll get a more thorough analysis. First, a brief announcement in the Vietnamese press. (PLO) - International Forestry and Agriculture Organization (FAO) said the H7N4 bird flu virus has emerged in Cambodia. This new strain previously detected in China in 2018. FAO assessment new bird flu strain that can appear anywhere and anytime, so Vietnam needs to maintain a research laboratory capacity to detect and prevent. Before this warning, in the Conference national plans to deploy anti-bird flu period 2019-2025 by the Department of Animal Health held on 22-3, Deputy Minister of Agriculture and Rural Development Phung Duc Tien that can not be ignored, subjective in prevention. Under the plan approved by the Prime Minister in mid-May 2-2019, the veterinary service will focus not to the branch block, new dangerous viruses infecting Vietnam. With the current strain, to vaccinate at least 80% of the total. Try to minimize or not arising cases of human avian influenza. Epidemic of avian influenza A / H5N1 appeared in Vietnam in late 2003, then spread to the whole country. The period 2007-2013, each year to slaughter 200,000 poultry have spread to 42 people, dying from this virus. Since mid 2014, the epidemic is under control, reduce the number of poultry to be destroyed while 90,000 children each year, no patient deaths due to influenza A / H5N1 as well. 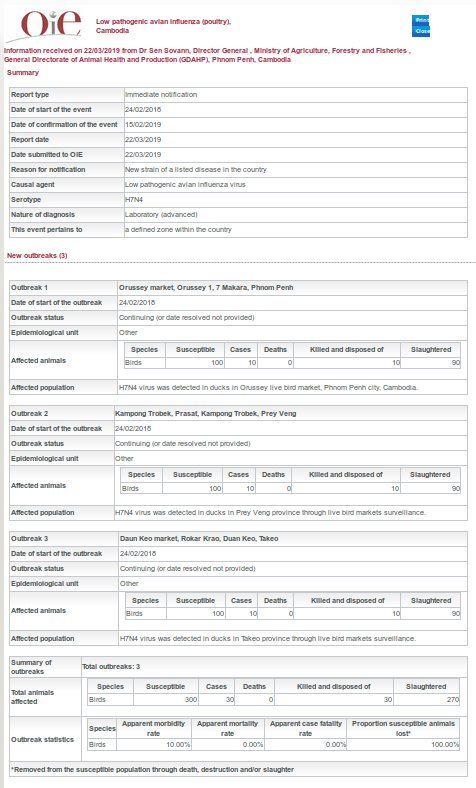 Active surveillance conducted in collaboration between National Animal Health and Production Institute (NAHPRI) of the General Directorate of Animal Health and Production (GDAHP), Institut Pasteur du Cambodge and FAO in live bird markets and other high risk sites has identified multiple H7 low pathogenic virus in 2018. The susceptible population in each market was more than 100 and the cases were 1-10 per markets. While today's report doesn't tell us much about the current dispersal of H7N4 viruses in southeast Asia, we now know that that this subtype was circulating in locations more than 2,700 km apart (see map below) in February of last year. A sobering reminder of how little real-time data we really get on the evolution, and spread, of potentially dangerous avian flu viruses from many parts of the globe.